Are you looking for an easy way to help sell your excess ice time? A way that advertises your ice to buyers, generates new relationships, sends instant notifications and works 24/7 to sell your ice. Rent My Rink is where ice arenas, teams and associations list their ice for sale. Other activities, such as open skating, tryouts, figure skating, drop in hockey, skills training and sticks & pucks are listed too. If you are in an ice contract program and you want to sell excess ice, you may be able to sell it today! Coaches, team managers, skaters and skills trainers are trying to find ice now. List your excess ice time for sale and start selling it now! Click on the ‘Sell Ice Time’ button to get started. This will take you to our Membership Sign Up page where you can select the subscription package that best suits your needs. From hockey coaches who are looking to list just a few ice times each month to arenas offering hundreds of ice times, we have packages in place that cater to your specific requirements. Select the package that works best then complete the check out. You will be e-mailed your subscription information along with your login and password credentials to access your account. Once you have signed into your account, click on the ‘My Account’ link at the top to begin selling your available ice times. You will be taken to your Member’s Dashboard where you can access all the features of your account. The first thing to do is to set up your profile information by clicking on the ‘Edit Profile’ button on the right. Here you can set up a profile image, your name information, contact details, and also the seller contact information that will be listed when you post your available ice times. Take your time to fill all of this out and then select ‘Update Profile’. Once your account information is correct, click on ‘Back To My Account’ to return to your Member’s Dashboard. Now that your profile is set up you can start adding your arena information. Click on the ‘Add Arena’ button to get started. Enter the name you want associated with this arena and then click ‘Add Arena’. You can now set up the details for the new arena by clicking on the ‘edit’ button. This will take you to the ‘Edit Arena’ page. The description area will be displayed when someone clicks on your arena name in the search results. It’s a great spot to add some details about your location. Rentals, food, times of operation, and other pertinent details are perfect here. You can also set the total number of rinks that are inside of your location. Once that information is in, scroll down to the address section. 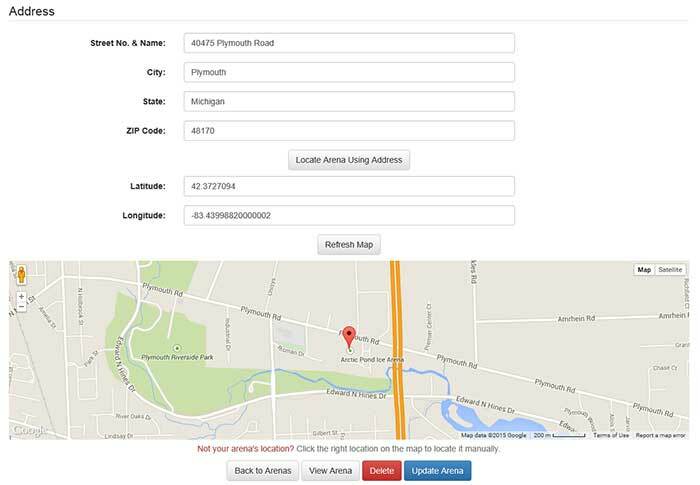 Enter in the street, city, state, and zip code information into the corresponding entry fields. When you click ‘Locate Arena Using Address’ the map below will populate and show your arena location on the map. It will automatically generate the latitude and longitude geographic information that our custom search filters will be using to help buyers looking for ice times. Sometimes an arena may be set off slightly from where the mark on the map is listed. If you click on the map itself on the proper location it will move the marker. Once it’s sitting perfectly, click on ‘Update Arena’ to finalize the new arena listing. Now that the arena information is in place, click on the ‘Add Ice Time’ tab to start listing your available ice time. Click on the ‘Add Ice Time’ button. Name the ice time, we recommend that you use something that describes what is available. That will make it easier for the potential buyers to quickly understand what your listing has to offer. Once the new ice time is created, click on the ‘edit’ button to set it up. The description is again another area that you can populate to provide more details for someone who is more closely inspecting your listing. You have 250 characters to use in any way you deem fit to best display your ice time. You can also leave this area blank. It will not effect the listing showing up in the search results. Set the price, and then you can also click on the ‘Is Best Price Available’ check mark if you are willing to negotiate. This will be a part of the buyer’s filtering system. Set the start time and end time for the listing as well as the start date and the end date. This will be displayed on the search results and will also help the buyer’s when they use the search filters looking for available times. 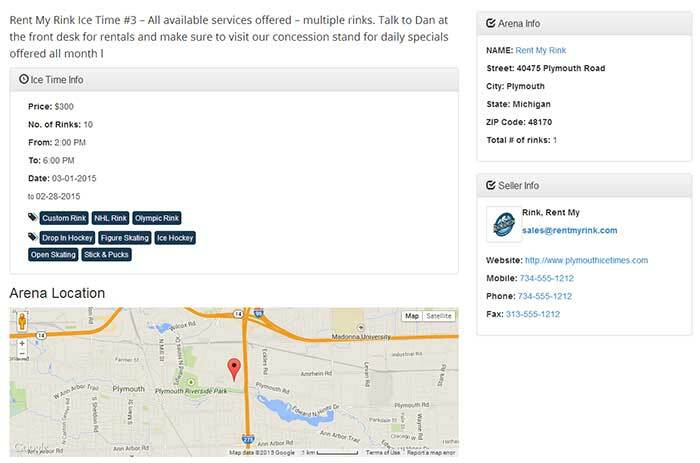 Finally, you can select all of the available services and ice rinks associated with your ice time listing. If you do not click on the check mark these services and rink types will not be associated with your listing when the filtering system is being used. When your ice time is completed, click on the ‘Update Ice Time’ button to make your new ice time live in our ice time listings. Click on the ‘Back To Arena’ button to return to the arena page, or click on the ‘My Account’ tab to return to your Member’s Dashboard. The ‘Add Ice Time’ button will now display the number of ice times listed with that arena. You can add more, or visit the Start Buying page to see your listing in the search results. If you click on the ice time name it will take you to an individual page that shows all the description information that you added to the site. It also populates with a map showing the potential buyers exactly where your arena is located and it will give them driving directions! The hassle and headache of selling your ice times is now a thing of the past. 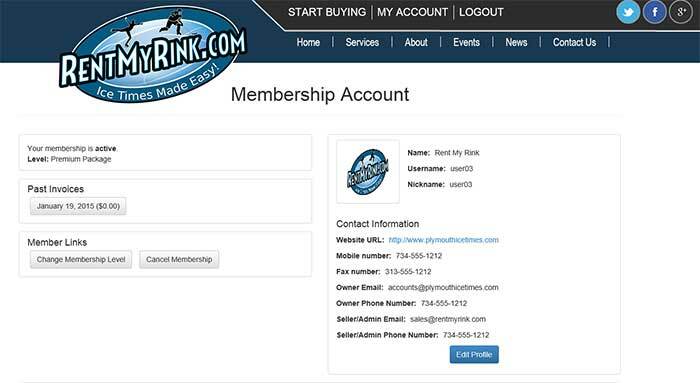 Sign up with Rent My Rink today and start listing your available ice time on the fastest and easiest system on-line today. 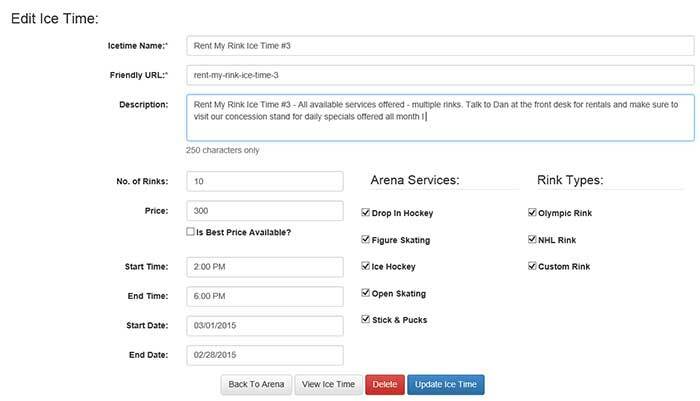 Rent My Rink – Ice Times Made Easy!